I was sad to see my water marble pink chevron mani go away ~ I think it was my favorite one yet! I decided to pull out the Zoyas since I haven't fully swatched or used any of them yet. 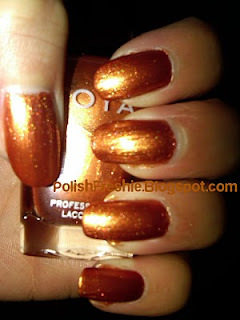 I decided on Zoya Penny. This is a gorgeous metallic bronze with itsy bitsy micro gold, red and copper glitter. The application was nice and I could have gotten away with two coats, but I had a few bald spots so went for three. While I love the color it just doesn't say summer to me. This would be perfect when October and November roll around. I also haven't tried my Sinful Colors All About You gold glitter. This is a clear base full of small round gold and red glitters. I sponged the tips with a standard makeup sponge. I think these two go great together since they offer the same red and gold hues. I then smoothed it out with one coat of Seche Vite. This will survive until my vampire entry for PHD due Friday. Very pretty! I definitely agree that this is a fall color, though. Thanks Danielle, let me know if you remember~! I love the combination! and the sparkles! oooo! NoSugar - yay sparkles! I wasn't sure if they would contrast enough or not.